wheremmsgather: The Tea Party is Being CAT-ered! Someone forgot to pony up the dough for our air travel to da Muddermark’s (that’s Mothermark to most of you) weekly tea party, so we’ve been grounded in the good ol’ USA this week. I’d like to thank Sabrina (Cook22), once again, for the grand time we had in Dublin last week. She is such a gracious hostess and really knew how to handle some of the rowdy ones in our group (I won’t mention names). KrisChir sent da Muddermark a picture of this absolutely adorable teapot she owns for our inspiration teapot this week. Isn’t it really cute? Cindy has hired a few of my CAT-ering staff to help out with today’s shindig, so bring a dish to pass and let’s Throw one on the Barbie!! These cool cats know how to barbecue one mean fillet of mousie for the main entrée’. Absolutely scrumpdillyicious! I masked this kitty image and stamped it five times and colored each kitty with Copic markers. The blue kitty in the middle is the head chef, so he gets the honor of wearing this cool chef’s hat from H&M Stamp’s It’s Picnic Time! Stamp set (the sentiment is also from the same set). You’ll note that the head chef also gets to wear a solid red bandana while the cat-erers-in-training are wearing their trainee scarves of gingham. I used the sketch design from Midnight Madness (MMSC9). My color choices from the inspiration teapot also fit pretty good with a color challenge given to my Doubledog Dare group by sleepyinseattle (aka Joanne) to make a summer-themed card with summer colors! What’s hotter than summer sun and real red with a bit of blue tossed in to cool us off a bit from all the hot, hot, hot colors? I hope you’ll have a chance to join us at the tea party today! We always have a lot of fun! Thanks you so much for playing..
hot, hot hot! my DH is 6'2. there's one house in our neighborhood who has the most gorgeous yucca plants AND they bloom every year! the bells are so huge you could almost ring them! This is just way too adorable, Charlene!! Love this image, and the vibrant colors...will have to head over to see the tea pot! Awwwww..this is just too, too cute!!! LOVE those cats. And the brad trio over the ribbon is ultra cool Charlene!! You always have such clever ideas!! Well, I waited a day, to give you some time to cool off from being mad at me! And I came in the back door of your blog.....hoping to be sneaky like.....and I brought you a little red wagon filled with M & Ms...there are some peanut butter ones, some almond ones, some peanut ones, some plain ones, some that say Bertie on them, and some that were specially made in the kitchen of the CAT-erers that are yet to be released! Be thinks we are friends again after this wagon of M & M's!! Do I know you well or what? I loved your card. Did you know you are a good masker? Its so precious, so much so I might even ask your CAT-erers back! Hee! You crack me up Charlene...as does Cindy!! You always make me smile!! YOur kitties are too cute!! What an awesome job on the masking!! Awesome job with the sketch!! Thanks for playing with the MMDT this week! Charlene, sounds like another rowdy time at the teaparty this week!! Your masked cat-er-ers are adorable...did they cause trouble? I see you are being given peace offerings of m&m's...what a deal!! Wonderful card and beautifully colored, Charlene!!! So cute!!! 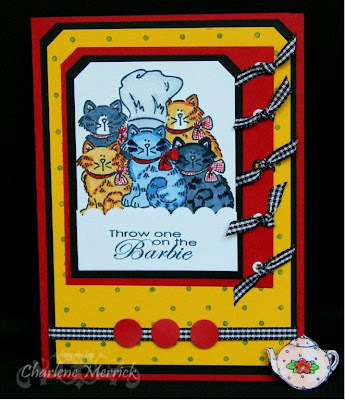 Charlene...your cat card is gorgoeus!!! I love your coloring and I love how you ties all the ribbons along the side!!!! You won't have to go in the back door with this beauty (hope there is a litter box handy)!!!!!!!!! Charlene, this could not be cuter! Love the bright colors and awesome detailing. Your coloring is fab! Oh, my! How clever to mask that cool kitty so he could partay with friends. Great idea and cool BBQ colors. Left something for you on my blog.